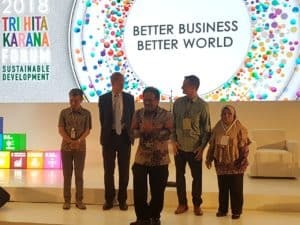 On October 10, Lestari Capital launched the Sustainable Commodities Conservation Mechanism (SCCM) – an innovative new financial mechanism to meet the demand for forest protection and restoration – with global agribusiness company Cargill as a first client. Cargill has committed 25 years of funding through the mechanism to support Nanga Lauk community forestry in West Kalimantan. The launch was attended by Gabriel Eickhoff, CEO of Lestari Capital, Colin Lee, Director of Corporate Affairs of Cargill, Ibu Rusliyani a member of Nanga Lauk Village Forest Management Board, Matthew Rycroft, Permanent Secretary, UK Department for International Development, and Sofyan Djalil, Minister of Agrarian and Land Use Planning of the Republic of Indonesia. The launch took place at the 2018 Tri Hita Karana Forum and was held in conjunction with the World Bank International Monetary Fund Annual Meetings in Bali. The Forum was endorsed by Indonesia’s President Joko Widodo. The SCCM finances projects over a 25-year period and provides independent fiduciary oversight that ties payments to results on the ground, ensuring benefits to local communities, global climate, and biodiversity. The SCCM is hugely innovative, providing a much-needed solution to the issue of long-term finance for forest conservation. Through the SCCM, Cargill is supporting a Community Forest (hutan desa) project in the Heart of Borneo region, which is home to endangered species, including orangutans and a highly biodiverse wetland. By adding an environmental asset to Cargill’s supply chain, the company is supporting a critical element of the natural climate solutions required to meet the objectives of the Paris Agreement. Partnerships for Forests (P4F) has supported this innovative business model which has the potential to finance conservation and restoration more efficiently and on a greater scale while strengthening demand for projects that protect critical areas. The SCCM has a clear path to revenue sustainability once at scale and P4F has acted as an incubator, providing grant finance to strengthen the business model, engage key stakeholders and undertake legal due diligence. Further support through P4F will support a full pilot of the SCCM, including financial modelling and set-up of a payment mechanism; vetting and contracting of projects, including legal review, due diligence and safeguards; business development to expand corporate commitments to the SCCM; and risk mitigation, stakeholder management, and transparency.